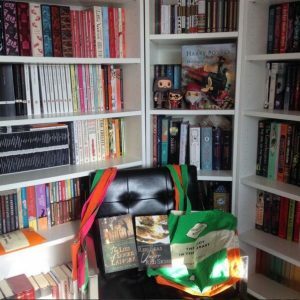 Before we get to the discussion, let’s stop and appreciate this week’s featured photo from @bookishsteph1 whose reading nook is perfection. I have serious shelf-envy over all those beautiful Penguins! REMINDER: This post will contain spoilers for the entire book. You have been warned! We made it! 530 pages, 45,000 crowns sunk, 12 religious orders impersonated, 3 Gentleman Bastards murdered, and just 2 remain. I could talk for days about this book, but the first thing that needs to be said is: is the friendship between Locke and Jean not one of your favourite bro-mances in literature? For me it is up there with Sam and Frodo as a friendship based on respect, love and sacrifice. I am so glad that there are more books to explore it in, because one without the other is not a whole. My next burning question is: Does Locke learn anything? We all love to see a character grow, and I’m only just convinced that the almost-dead Locke of the final pages has learnt a thing or two since losing his friends. His policy of ‘never stop talking’ is still one of my favourite parts of the book though, it was endlessly amusing to be tickled with surprise and mirth at Locke’s snappy comebacks and wry humour no matter the situation. When Jean asks if Locke has a plan for their final con, to get the clothes they need to attempt to get enough money to leave the city, Locke replies with ‘Not the damndest idea. But don’t all of my best schemes start like this?’ I was torn between laughing at his flippancy and cringing as he set off to do something as ludicrous as talk Giancana Meraggio out of his clothes. Literally. But this set up for another scene that made me snort with laughter, when Locke smoothly embarrasses Meraggio for his (entirely accurate) recognition of his outfit. So despite his continued faith in his ability to talk his way out of everything being undercut again and again, he somehow always manages to have the last word. The constant interplay between knife-edge tension, violent outburst, and humour was for me the highlight of this book. Yes I enjoyed the world-building, the backstories and history were even more interesting the second time around, but I agree with what a few of you have mentioned, it is quite overwhelming in places, and in some cases not entirely necessary. The simmering tension throughout, broken by bubbles of laughter I couldn’t suppress, made this one of the most memorable and entertaining reads in the fantasy genre that I have come across, and very much deserving of its place on my favourites shelf. I hope you all enjoyed reading with me, for the experience even if you didn’t love the book, and I can’t wait to hear your thoughts below! 2. What was your favourite quote in the final section? 4. What were your thoughts on The Lies of Locke Lamora as a whole? As much as I love these readalongs (you guys are amazing) it’s hard for everyone to keep up with the discussions, as everyone reads at their own pace. So, if you are keen to join me, I will continue to host but with monthly discussions rather than weekly, starting from April 1st. Keep an eye out for the April book announcement on instagram, or sign up to the newsletter for an announcement straight to your inbox. *Update* April Book Club book has been announced: Uprooted by Naomi Novik. Start reading April 1st, updates via newsletter. Overall, this book was amazing! It was a slightly slower read for me in that I wasn’t able to sit and read this entire book in one day. It was no less interesting though and definitely still detailed and complex. I’m really curious to read the next one in the future to see how this story progresses. The fight between Capa Raza and Locke was so suspenseful. I kept thinking afterwards though that he won in this fight just like Chains said he would (with a little bit of deception). I really liked how it mirrored his past battle with Tesso as well. And lastly, I really loved the ending when Dona Vorchenza finally puts it all together (that they’ve been digging for nothing and that the gold on the ship was an offering). Which honestly, I’m glad that part was cleared up through her character, because it wasn’t clicking with me why Locke would want to sink the money. To answer the questions, 1) I also really loved the Daughters of Camorr side story. So entertaining! 2) Favorite quote was put above– oops! 3/4) 4.5/5 stars, I believe. It was truly a very good book. You do get bogged down a little with the detail, so it isn’t the easiest read. I was always surprised though and never knew what was really going on, which is so rare in a book! I really appreciated that aspect of it and really loved it overall. Also, thank you, Tamsien, for hosting this readalong! I’m glad that I had a good experience with my first one! Great choice of book, and I can’t wait for your April read with your book club. And thank you to all my other fellow readers! This was a really enjoyable read with you all. It was so much fun to see all your opinions and different perspectives throughout the book! I hope everyone has a great reading month! Thank you so so much for your comments Mary. It’s so wonderful to hear that you enjoyed the experience and the book! April is ‘Uprooted’ by Naomi Novik, and I hope that you will be able to join us! Just a quick comment from me! Just wanted to say thank you Tamsien for hosting this and introducing me to this series. I have the 2nd book but giving it a few months before reading it…too much emotion 😆 I’m looking forward to the monthly book group. Loved this book and gave it 5 stars! I think my favourite interlude was the same one as Tamsien mentioned. My favourite quote was the same as Mary. It tickled me too! Wow. Ok I am a little late finishing bc lots of really unexpected life events happened. But I finished Lies yesterday and again I say WOW. And a resounding THANK YOU for introducing me to Locke’s world. I have already ordered the box set of the trilogy so I can continue on with the Gentlemen Bastards. I ugly cried right along with Locke as he sobbed his grief out on the body of the Grey King. I wish I could have been more engaged this go round with discussion. But I like your descison to have one big discussion. I think that will be great! Can’t wait for April reads! Thanks again for a spectacular choice that I’m adding to my list of favorites. So glad you enjoyed it Katie! The April book has been announced 🙂 It is ‘Uprooted’ by Naomi Novik. I hope that you will join us for it.